We are one of India's leading travel service providers of Deccan Delight Tour, specialized in providing customized travel services to tourists visiting the Indian Sub-Continent. Our Deccan Delight tour package covers almost all important sightseeing places of all the five Southern States namely Andhra Pradesh, Karnataka, Kerala, Pondicherry and Tamilnadu. Stay in confortable hotels and visit places at leisure, is how we have planned this tour. Our package will take YOU to less explored destinations at a price that is competitive. AM: Arrive Hyderabad and on arrival meet, greet and transfer to hotel. PM: Visit to the Charminar, Lad Bazaar, Mecca Masjid and Salar Jung Museum. Overnight hotel in Hyderabad. AM: After breakfast visit to Golconda Fort, famous for its diamond mines and nearby Qutub Shahi tombs. PM: Exploring the Hyderabad of "White Mughals" with the old residency and newly restored Nizam's Falaknuma Palace, now part of the Taj hotel chain. Overnight hotel in Hyderabad. After an early breakfast drive to Bijapur (around 10 hrs). There will be a lunch break and a stop en route to visit the fort and tombs of the Badmani kings in Gulbarga, including the Jama Masjid. Overnight hotel in Bijapur. Spend the full day exploring Bijapur, visiting Gol Gumbaz, which has the second largest dome in the world, after St Peter's in Rome. You also visit the tomb of Ibrahim Roza and that of Mohammed Adil Shah. Overnight hotel in Bijapur. 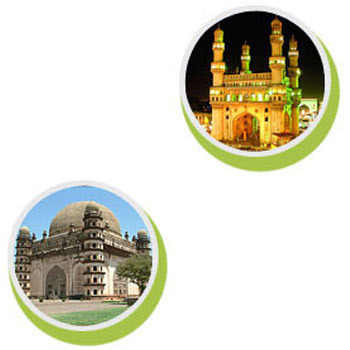 Looking for “Deccan Delight Tour”?